Easy Crunchy Chicken Fingers with a side coleslaw. Kids love chicken fingers a perfect meal for all. Heat oven to 450F. Line a rimmed baking sheet with foil (for easy cleanup). Lightly coat with nonstick spray. Beat egg in a shallow bowl with a fork until frothy. Add tenders and toss to coat. In another bowl, mix crushed chips, paprika and salt. Add tenders, a few at a time, and toss with a fork to coat. Place on prepared baking sheet. Bake 10 minutes or until chicken is cooked through. 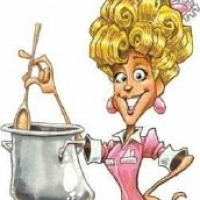 Meanwhile put Coleslaw ingredients in a bowl; toss to mix and coat. 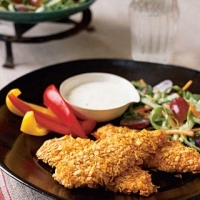 Serve tenders with ranch dressing and the slaw. Oh an easy recipe. This is my kind. "FIVE FORKS"
This recipe looks very good. You have my 5. Sounds great, and excellent tip to cut off that wretched little tendon ... hate that thing lol! I like this simple and easy recipe!